While some of your Halloween party guests will be fighting for awards like the scariest costume, sexiest costume, and funniest costume, others will be vying for the supreme title. They want to win the Best Costume 1st Place Halloween Ribbon! Each black satin ribbon really feels like an award with its pointed top, grommet, and serrated bottom edge. The recipient of this ribbon will be sure to cherish it for years to come! The Best Costume 1st Place Halloween Ribbon hangs on a golden loop and spells the words "1st Place" in silver, "Best" in red, and "Costume" in gold. These eye-catching metallic letters are sure to grab everyone's attention when you are about to present this prestigious award! 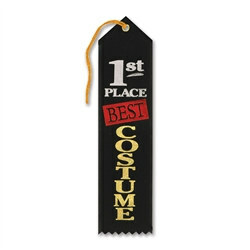 Add a little friendly competition to your costume party with this special award! Decently nice little ribbon. Nothing extraordinary, but it will work well for what I need. Thanks!